The Santa Cruz Triathlon is back, with another scenic Olympic-distance and Sprint race. With ocean views and a great vibe, the race is a ton of fun. Its also a fundraiser for local youth sports in Santa Cruz County. Formerly the Sentinel Triathlon, the event has been held in Santa Cruz annually for the past three decades. Swim - The swim corral will be located on Main Beach in front of the Boardwalk bandstand. 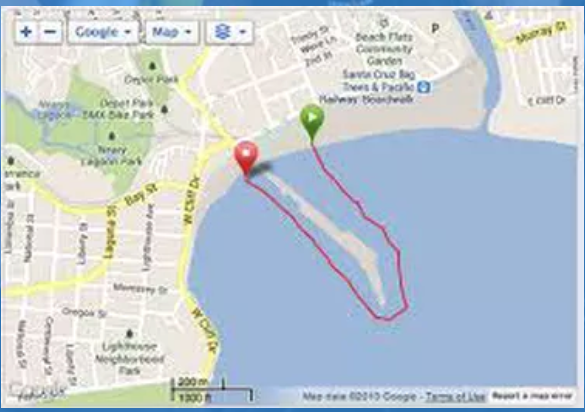 Swimmers will start in waves, heading clockwise around the Wharf and exiting the water at Cowell Beach. From there, swimmers run through the parking lot, across the street and up a paved path to the transition area. Volunteers will guide racers. In the event of extreme fog delays, an alternate swim course that parallels Main Beach will be utilized. Right on Natural Bridges Drive. Stay left on Washington Street Extension (over the train trestle) and back down the hill to transition. Watch for dismount area just before the base of the hill! 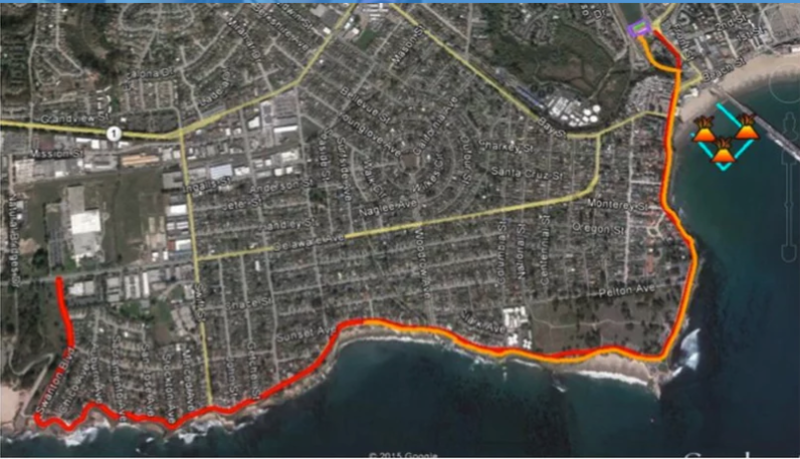 Swim - The swim corral will be located on Cowell Beach in front of the Dream Inn. 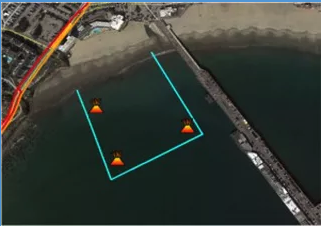 Swimmers will start in two waves beginning at 9:30 a.m., heading clockwise around the three buoys and exit the water at Cowell Beach. From there, swimmers run through the parking lot, across the street and up a paved path to the transition area. Volunteers will guide racers. The swim start time could be impacted if an extreme fog delay slows the start of the Olympic swim. 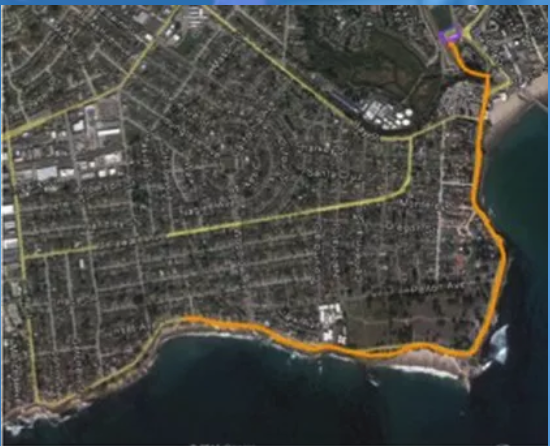 The bike course is two loops on West Cliff Drive. Exit transition and head up Washington Street Extension across train trestle onto West Cliff Drive. Continue on West Cliff Drive to turnaround. Return on West Cliff Drive to Cowell Street turnaround. Go into the first driveway of the transition area. Run - The Run Out section from transition is on the path that goes under the train trestle. The turnaround at David Way on West Cliff Drive. Note: The Swim In and the Run Out both follow the path at the back of the park and go under the train trestle, avoiding the street traffic on Pacific Avenue. The Bike In and Out still go on the road overpass, above the train tracks. 6 a.m. – Transition area opens for Olympic racers, including Open Water Swim, Aquabike, Athena/Clydesdale and Relay. Check-in and body numbering begins. Be sure to arrive at least one hour prior to race start in order to have mandatory body marking, transition equipment set up and attend mandatory pre-beach meeting. 7:45 a.m. – Final instruction and mandatory race meeting for all Olympic race participants on Main Beach by Lifeguard Tower #3. 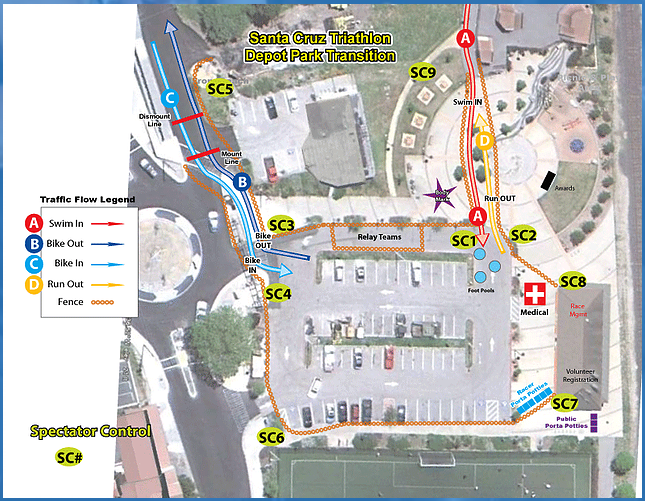 8 a.m. – Transition area opens for Sprint racers. Check-in and body numbering begins. Be sure to arrive at least one hour prior to race start in order to have mandatory body marking, transition equipment set up and attend mandatory pre-beach meeting. 8-8:30 a.m. – Olympic swim waves starts, including Open Water Swim, Aquabike, Athena/Clydesdale and Relay. 9:15 a.m. – Final instruction and mandatory race meeting for all Sprint and Sprint Aquathlon race participants on Cowell Beach below the Dream Inn. 9:30 a.m. – Olympic swim course closes; Sprint swim starts. 12 p.m. – Bike course closes. 12:30 p.m. – Run course closes. 1 p.m. – Transition area closes. ALL EQUIPMENT MUST BE REMOVED BY THIS TIME. AREA WILL NOT BE SECURE. ALL ITEMS LEFT IN THE AREA WILL BE REMOVED. The Santa Cruz Triathlon starts at Depot Park, 119 Center St., and finishes at nearby Dream Inn, 175 W. Cliff Drive in Santa Cruz, CA. The transition area is located at Depot Park. You can park in the neighborhood surrounding the transition area. The streets immediately surrounding the finish area will be closed. These are Gharkey, Centennial, Laguna, West Cliff Dr. between Bay and Gharkey and Bay Street between West Cliff and Laguna. Please try and be quiet when parking in this residential area, we want to be able to stage this event for many years. The nearby Santa Cruz Beach Boardwalk has several public lots and the daily parking fee is $10. If you park in a spot with a city meter you should note that parking meters are enforced on Sundays so plan accordingly. Race Day Directions to Depot Park, 119 Center St.
Find parking in adjacent neighborhoods; pay attention to parking meters. Race Day Directions to Boardwalk parking, 400 Beach St. Right on San Lorenzo Blvd. Only numbered athletes will be allowed in and out of the transition areas. Athletes must wear their race number on their upper left arm, upper right leg, front of their body and on their bike frame behind handlebars. Please identify all equipment, such as your wetsuits, with name or race number. 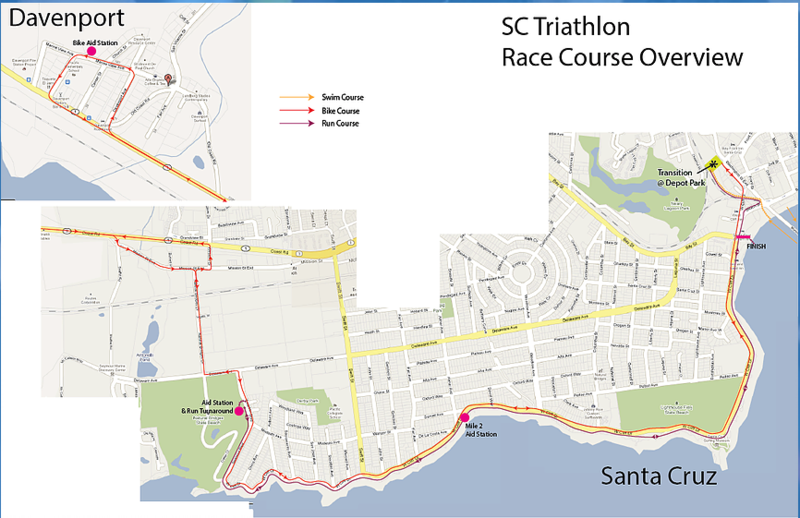 Do you want to be part of the Santa Cruz Triathlon, but you don’t want to race? ​Volunteers are a vital part of our event. They help ensure the safety of the racers and make sure the race goes smoothly. Come be a part of our team and volunteer! I am not a USA Triathlon member and do not want to be a member, why do I have to join? USA Triathlon sanctions the Santa Cruz Triathlon, and USA Triathlon membership is required for all racers. You can purchase the one-day membership during registration and are encouraged to do so. If you have a USA Triathlon membership card, you must bring it to pick up your race packet; otherwise you will be required to pay the nominal fee. Having this sanctioning provides sponsor benefits, insurance coverage and racers are able to receive points for their national ranking. Do I need a wetsuit for the swim? A wetsuit is strongly recommended for the swim course but not required. The water is cold (55-60 degrees), there can be a current, and there can be swells and chop. A wetsuit offers advantages of warmth and buoyancy.